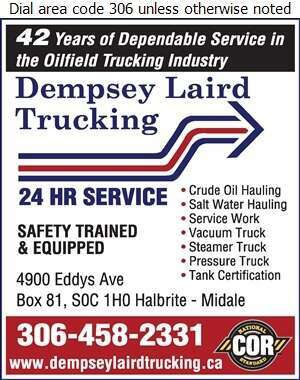 Established in Halbrite, Saskatchewan, Dempsey Laird Trucking has over 40 years of dependable service in the oilfield trucking industry. 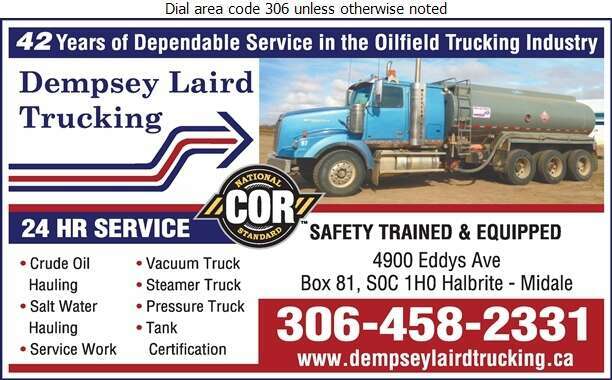 Dempsey Laird Trucking is a family owned and operated trucking company in the heart of the oilfield. Since 1978, our team has been providing the following oilfield services; crude oil hauling, salt water hauling, service work, vacuum truck services, steamer truck services, pressure truck services as well as internal tank truck washing. At Dempsey Laird Trucking, we take the safety of our employees and our customers very seriously. We are COR Certified, and are continuously up-grading our training to meet our customers' needs. For your convenience, the expert team at Dempsey Laird Trucking offer 24 hour service.